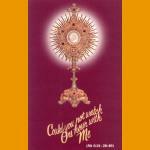 D-1 ($1.00) Front, Gold Monstrance with Host/Burgundy background, white writing “Could You Not Watch One Hour With Me?”. Back, Prayers of Fatima. Actual Size 2-1/4” x 6-1/2”. 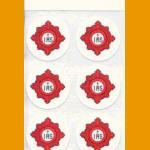 D-2 ($10.00 per 100) Business card size. 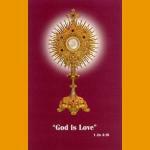 Burgundy Monstrance and words "God is Love" on white background, on front. Uplifting message, with to, from and date spaces, on back. Size 2 x 3.5. 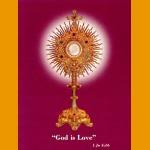 D-3 (ENGLISH, $29.95 per 100) Gold Monstrance with Host/Burgundy Background. 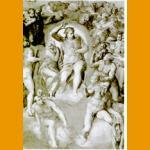 Perpetual Eucharistic Adoration and spaces for day and hour in black writing. 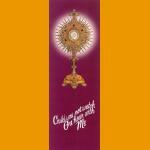 D-5 ($2.00) Front, Gold Monstrance with Host/Burgundy background, white writing “God is Love.” Inside left, Angel’s Prayer at Fatima. Inside right, For someone Special space, uplifting message of prayer, from and date spaces. 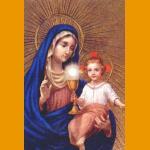 Back, chalice and Host in black, Fatima Prayers. Actual Size 4-1/4” x 5-1/2”. 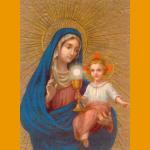 D-M ($2.00) Beautiful color picture of Our Lady with Christ Child, holding chalice and Host. Blank inside. Size 1-1/4 x 5-1/2. 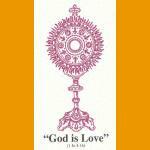 D-6 ($1.00 per 4) Front, Gold Monstrance with Host and Burgundy background, white writing “God is Love.” On Back, “This picture is of Jesus present in the Consecrated Host (Body, Blood, Soul, and Divinity) lifted up in a monstrance. He waits for us to heal, console and strengthen us and fill us with His love, joy and peace. Come and see Him today!” Actual Size 5-1/2" x 3-1/2". D-7 ($20.00 per 100) Front,Gold Monstrance, Host and Burgundy background, white writing “Could You Not Watch One Hour With Me?” Back, “YES! I’m willing to spend One Hour a week with Jesus.” Space for Name, Address and Phone number. Actual Size 5-1/2" x 3-1/2". 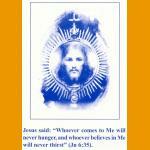 D-9 (ENGLISH, $15.00 per 100) Blue and White picture of Mother Teresa with quote on Eucharistic Adoration. 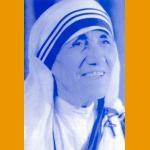 Adoration prayer of Mother Teresa. 3 x 5. 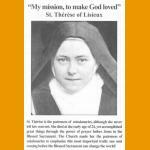 D-10 (ENGLISH, $15.00 per 100) Black and White picture of St. Therese, patroness of Missionaries, on front. Beautiful Eucharistic prayer on the back. 3 x 5. 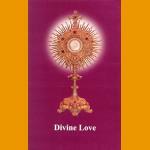 D-11 (ENGLISH, $15.00 per 100) Beautiful gold Monstrance on front.. 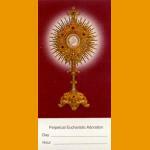 Prayer affirming the Real Presence and asking for the spread of Perpetual Eucharistic Adoration on back. 3 x 5. 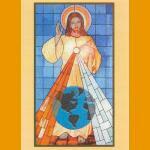 D-13 (ENGLISH, $15.00 per 100) Jesus with His Eucharistic Rays of Mercy pouring out over the whole world on front, in full color. Inspiring and timely prayer for life with quote from St. Faustina on back. 3 x 5. 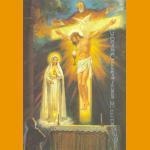 D-15 (ENGLISH, $15.00 per 100) Color picture of "the last vision of Fatima," with the Holy Trinity and Our Lady. Angel's prayers of Fatima. Size 3 x 5. 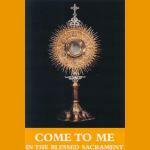 D-16 (ENGLISH, $15.00 per 100) Contains passages from John 6, and other Bible quotes, proclaiming the Real Presence of Jesus in the Holy Eucharist. Great for apologetics! Size 3 x 5. 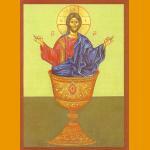 D-17 ($15.00 per 100) Awesome color icon of Jesus in Chalice on front. Spiritual Communion Prayer, Anima Christi on back. Size approx. 4-1/4 x 5-1/8. 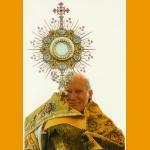 D-18 (100/$15.00) Pope John Paul II, Great Apostle of the Eucharist: Beautiful picture of Pope John Paul the Great, holding the Monstrance. Eucharistic quotes from Pope John Paul II's writings on back. Size 3 x 5. D-20: (100/$15.00) Compelling black and white picture on front. Prayer & Chaplet of St. Gertrude on back, said to release 50,000 souls from Purgatory when recited. Size approx. 3 x 5.